Lollapalooza review No. 9 is.... da la da la da la (drum rolls are important!) 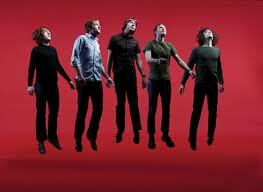 - Minus the Bear!!! Not only do they have such a wicked name - confession: my name is Kanae, and I am a bearholic - but also their performance on the stage was excellent! The Seattle indie band hit the stage on Sunday between 3p.m and 4p.m. It was very humid and everyone was sweaty. It was a very hard day to start after two days of continuous partying. It was about the time for me to realize that I am not 20 years old anymore - having a good night sleep does so much for me at the age of 25! The heat/lack of sleep wasn’t even the difficult part of Sunday. Scheduling which bands to see on Sunday was the hardest of the 3 days – there were just too many good bands playing at the same time. Thus, some people are jumping from one stage to another; only checking out a few songs from each band - which I ended up doing too. I only knew a few songs by the band; so I wasn't sure how much I would like it. I definitely like the songs that I know – they are catchy and on constant repeat in my head. I just wasn't sure how well they would translate live. Regardless of my pessimisms; the band gave my attitude an extreme makeover! They were so much fun to watch! They played not only from the newest album; OMNI, but also from their old albums. That's what I like about music festivals – bands play their most familiar songs from their catalogue. This band is no.9 as they made Lollapalooza day 3 very easy to start for me and it was the very first time when 6 of us stayed watching the same band lol. I missed their show here in Toronto last month; I’m glad I saw them here! Now they are heading to Europe for some gigs. So if you are in Europe, check them out! It's worth it! Here is the video of my favorite song, my Knight! Stay tuned with the rest of the ranking!